Here in the South, we have a dish called chicken and waffles. Basically it’s chicken fingers served over waffles and drizzled with syrup and butter. Let me tell you for someone who loves the sweet, salty, crunch, buttery combo, this is heaven on earth. Depending on where in the South you are, you either get sausage gravy or a side of peach or berry cobbler. Always go cobbler over gravy. That’s a no brainer, LOL. Gravy is meant to be brown, not some weird whitish gray stuff that resembles glue. 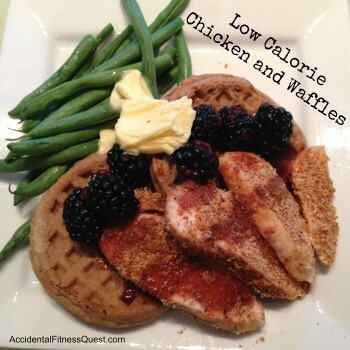 😉 I get asked all the time about eating things like chicken and waffles while dieting. You absolutely don’t have to give up foods like that. In fact, it’s more exciting to eat something that’s not your standard diet food while dieting. All you need is a little bit of imagination and suddenly you get a healthier version of chicken and waffles without a lot of effort or time. Toast your waffles according to directions in your toaster. Preheat the broiler on your oven and line a cookie sheet with foil. Slice your chicken breasts into strips that are shaped like chicken fingers and press the bread crumbs onto the chicken so they stick. Place the chicken fingers on the cookie sheet. Broil about 6 inches under your broiler until the bread crumbs start to brown and the chicken is heated, and remove. Place two waffles on a plate, top with the chicken fingers. Add the blackberries, butter, and drizzle with syrup. Makes one serving at approximately 400 calories – 28g protein, 36g carbs, and 16g fat. I used Van’s low calorie whole grain waffles that were 130 calories for two waffles. You can really use any kind of waffles that you like. To make my bread crumbs, I used the ends of the Nature’s Own low calorie whole wheat bread and just pulsed them into crumbs in my Magic Bullet. No one really eats the ends of the loaves, so why not use them for healthy bread crumbs. The calorie free syrup I used was made by Walden’s Farm. This is one of their products that I really enjoy. It tastes great without a ton of sweetness and has a great blueberry flavor. If you’re looking to lower calories even more, you could use less butter or leave it out all together. This recipe came together really quickly since it started with grilled chicken breasts instead of raw chicken. It saves a ton of time since you’re just broiling long enough to heat the chicken and crisp the crumbs a bit.